Happy Monday! I hope you had a wonderful weekend. 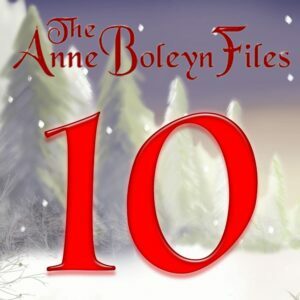 Today, author Natalie Grueninger shares a very Christmassy guest article with us today as day 10’s treat on our Anne Boleyn Files Advent Calendar. Just the thing to get you in the Christmas spirit! Thank you to Natalie for writing it. I hope you’re enjoying the Advent Calendar so far. We have lots more Tudor treats in store for you and you can catch up on any you missed too. To access the Advent Calendar, simply click on the picture of the number 10 in this post, or scroll to the top of the page and click on the link in our cover image. I really enjoy Natalie’s books. I didn’t know she had a podcast however. I found it and listened to the most recent episode. Very timely, an interview with Claire about Tudor Christmas traditions. Very fun and informative. I loved this post I have always been interested in the way our ancestors celebrated Christmas, and the way their traditions have been handed down to us over the years, the Tudor twelfth night cake which is the forerunner of our own Christmas cake and the mince pies which originated in the medieval period, (they actually contained meat) to become the popular dessert they are today, the greenery that was hung in every homes, be they a humble cottage to the must sumptuous of palaces, Christmas itself pre dates Christianity and it has its origins in an old pagan festival when our ancestors worshipped the gods of winter and summer, the green foliage that was brought in from the forests was the symbol of the fruitful earth when the summer would return to make all things grow, in the cold barren months she was imprisoned by winter and was released in the spring when her cold sister retired to her own chilly domain, down through the centuries it became associated with the birth of Christ and Christian countries all had their own way of celebrating, I read that in Germany it was traditional to eat a marzipan pig at Christmas and we loved marzipan in our family so I bought my mum and sister one from Culpepers herbal shop in Convent Garden, I love any kind of tradition, I too like Natalie love the smell of oranges and cinammons and iv had pot pourri in little dishes throughout the house, I don’t use pot pourri now as my cats had a habit of messing them up and they would all go everywhere on the floor, I got fed up with picking them up so now I just use scented candles, my father would gather fresh bundles of holly from the parks nearby and put it in a big cauldron shaped tub near the fireplace, you cannot beat the sight of fresh holly, winters traditional plant, you can get plastic imitations now but I think their so naff, I too like Natalie can visualise an old Christmas and to me it’s always snowing and there are groups of people on their way to church, lanterns held high, down the dimly lit winding lanes they go covered in thick woollens and there’s a solitary Robin perched on a barren branch, eying them feathers all fluffed up, the landscape is white and I can hear the carols coming from the little Norman church, there’s a man outside with a bowl of spicy punch, I can also see a Christmas celebrated in the old palaces and castles, the gentry richly dressed in furs and holding goblets of wine, great tapestries looking even more colourful against the great green boughs that would be placed all around the halls, minstrels playing and silver platters filled with oranges, studded with cloves, there is a charm about Christmas of yester year, in some years England suffered particurlaly bad winters and the Thames froze over completely, faires to the enjoyment of the Londoners and visitors alike would be held on the great river and there would be gingerbread men and pie man selling their wares, whilst the public skated around, I think it happened in the reign of Charles 11 and the sight must have been so colourful, we don’t get winters like that anymore though Britain had two very bad ones in 62 and 63, I remember the icicles as big as daggers on our old coal bunker, i don’t know how we survived as there was no central heating, we had open fires and convector heaters, in the great halls the fires were huge and in the medieval period there was the ‘Lord of Misrule’ and the waisalling bowl, (I don’t think iv spelt that right), in Elizabeths reign there was the tradition that she would crown one of her courtiers as ‘King Of The Bean’, her favourite the Earl of Leicester was expected to be crowned as such but it went to someone else as they had had a tiff previously, according to one source Leicester was furious, I can just see Queen Bessie simpering with relish as she eyed Leicester glaring at her whilst the lords and ladies stood around, when her father was involved with her mother the King had all but seperated from his first queen and Christmas then was said to be a gloomy affair, but Anne Boleyn had held court in her own apartments and presents were exchanged in the new year, one year she commissioned Holbein to make a beautiful golden font with several naked ladies spouting water from their breasts as a gift for Henry, and there are records of the gifts he sent to Mary Boleyn and others and the gifts they sent to him, one Christmas Queen Catherine sent her estranged husband a gift and he angrily refused to accept it and the trembling messenger was ordered to take it back, poor Catherine certainly was the epitome of the long suffering wife! Another Christmas in the court of Henry V111 saw two wives celebrating together, his discarded ex Anne from Cleves, and his new wife and queen, the effervescent Catherine Howard, the King was suffering from his bad leg and headaches by then and he retired to bed early whilst the youngsters carried on feasting and dancing, he must have really been feeling his age but by today’s standards he would be young still, Henry V111 was prematurely aged and the contrast between himself and his young wife was apparent to all, I find it sad to think of this once glorious King limping of to his bed chamber because he was tired and possibly in some discomfort whilst the gaily dressed company carried on celebrating, the image of his two wives dancing together is rather droll when we know his first two wives hated each other with a passion, although Catherines feelings were based on sadness and regret, and then we have his fourth wife and his fifth wife cavorting round the palace clearly both very fond of each other, the last Christmas his fifth queen would know would be spent under armed guard, in theory it was no Christmas for her at all, one can imagine the tears that fell as Christmas came and went, there would be no merry making for Catherine Howard, no dancing and feasting and exchanging of gifts, no hunting no exchanging of pleasantries, but I do not want this post to have a gloomy ending, so I will just say yo ho ho two weeks to go! I loved Natalie’s article, thank you! That’s so heart-warming to hear. I love doing my Claire Chats talks so it’s always lovely to hear that people enjoy them. Thank you so much for your feedback, it really has made my day. Keep an eye on your inbox as Tim is sending out email today to people who registered for the open weekend with details on joining, so you might want to pass that on to your husband. What a lovely hubby! Thanks again for your feedback. Would you mind if we use it as a testimonial please? Yes! I would love that! Oh, cool! I love reading articles on the old and new Christmas traditions. The green of course represents new life and the redness of the berries, the blood and sacrifice of Christ and the holy the crown of thorns. These symbols pre dated Christmas to the old Winter celebrations of the victory of the Sun after the darkness at the Solstice. Many societies had different ways to brighten up the darkness in those times and fires and bright decorations were used to cheer the place up. The Sun literally falls below the horizon for four days, or so it appeared and comes back on 25th December, reborn as the Victorious Sun. Yule logs were burning through this period to symbolise the fire of the sun and the life it brings. You can see why this date was adopted as the date of the Nativity of Christ, which was more likely between July and September, given that the flocks of sheep were out at night and the fact that you wouldn’t leave anything outside near Bethlehem at night in December. The Christmas story reminds us that Jesus didn’t remain a baby and ultimately came to die in sacrifice and to rise again in Victory, bringing new life to the world. The tree of course was brought to England by Prince Albert but is an old pagan and Christian symbol, used by Boniface to explain the Holy Trinity to Germans in the sixth century. Well, what else do you decorate in a land of forests and fur trees? In a way it is also very appropriate, for the tree dies and then lives again in the Spring. The evergreen trees are alive all the time. Only cut down can they die and we decorate them until their life and beauty fades away. Putting a tree up also brings the family and community together, we bond in love and fun and we share the beauty of preparation. We can stand back and admire its brightness and decorate it with other symbols of the Christmas story, the star, the crown, the angels, gold and even coins and chocolate which we all love to share. The evergreen gives us hope that the sun will come back, that life continues, that the cycle is not broken, that promises are being kept and everything rests and will be new again. Look up into the evening sky in the next few weeks. When it’s fine and cold, not raining, some of the clearest skies and brightest stars as well as Saturn, Jupiter and Venus will be at their most brilliant shining. Look out at dawn as Venus becomes the Morning Star. The Morning Stars proclaimed the Holy Birth. The Victorian Christmas is still how we think of our Christmas. The tree and the family, the cakes and the minced pies all have their origins now and we think of our presents under the tree. Speke Hall still Deck the Halls and you can learn how to make your own green and red decoration from leaves and berries. Christmas carols in Church is probably Victorian as before they were sung in the town and streets as people collected for the poor. The Nativity Scene is associated with Saint Francis who in the twelfth century in order to show local people the true meaning of Christmas brought in real animals, a real baby and real children to dress as Joseph and Mary and real Shepherds. Kings in these scenes later through the ages were added at Epiphany on 6th January. Christmas was celebrated for twelve days and you didn’t put up the decorations until December 24th, not December 1st. You opened your presents on December 26th as Christmas Day was for fasting and worship and going to Mass. Christmas Dinner was ate after Midnight Mass and still is in some parts of Europe because you fasted before Mass and had Mass again at Dawn and Noon. You had various celebrations during the 12_days and Twelfth Night was one mad party. Interesting traditional times. But remember, no matter how you do Christmas, everyone is welcome at Tesco.⛄❄ lol. No seriously, enjoy and a peaceful Merry Time no matter where you are. That is a beautiful post BQ. Your last line rhymes Bq, very appropriate!